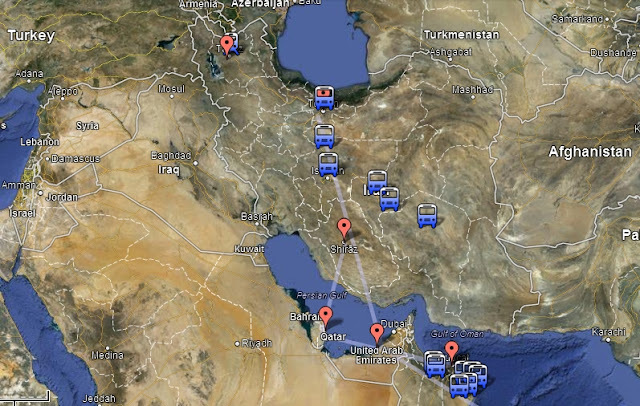 Kane and Narelle's Iran Trip - 2013: Where are we going this time...? In previous holidays our friends and family have said on our return it would have been nice to read about your travels as you went along. Maybe they are stalkers, maybe we go to unusual places or just maybe they just take comfort in knowing where we are: all three is my guess! This time around we are going somewhere very exciting and full of history. We are off to the old Persia (Middle East). We start in Oman, Qatar, move onto Iran for the bulk of the time and then we head back to Qatar. Below is a map of the places we intend to go...no doubt these will change as the 'wind changes' our direction. At anytime you can view where we probably are by clicking on our travel map link: Google Maps then on an icon or a place listed in the left column. We do hope you enjoy the posts and lots of pictures that we share over the next 5 weeks. Send us a comment/question etc and we will do our best to answer. Not much water for you to swim in, I wonder how many camels Narelle will get for you Kane? ?